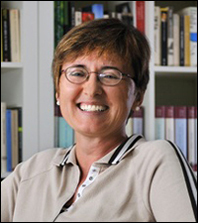 Raffaella Zanuttini received her PhD at the University of Pennsylvania in 1991 and is Professor of Linguistics at Yale. Her research focuses on comparative syntax. She has worked extensively on the range and limits of variation in the syntactic expression of negation (Negation and Clausal Structure: A Comparative Study of Romance Languages, Oxford, 1997). In joint work with Paul Portner, she has investigated the notion of clause type, focusing on the syntax and semantics of exclamatives and imperatives. Her interest in comparing minimally different languages has recently led her to investigate the syntactic diversity that exists across varieties of North American English. She founded the Yale Grammatical Diversity Project, whose goal is to document, describe and analyse the syntax of varieties of US English. Some of the work related to this project is collected in the volume she edited with Larry Horn, Micro-Syntactic Variation in North American English, Oxford, 2014.